Hee hee. Via Boing Boing. did i miss something? what does via boing boing mean? It's important to credit the places where you've found the stuff you've posted. 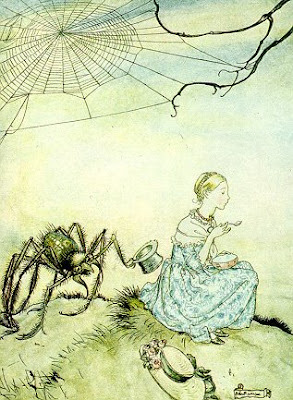 oh and also (i love this version): little miss muffet,sat on a tuffet, eating her curds and whey. along came a spider and say down beside her and frightened miss muffet away. miss muffet came back, from her gun rack, with an AK-47. she loaded and locked, made sure her ears were blocked, and blew that poor spider to heaven. OMG!!!! That is sooooooo awesome...... mwahahahha! On the first day of school I saved both a cockroach and spider from certain death! It was awesome! Dangerous: that's hilarious! Poor spider though.